Have you ever tried to take your days one by one when they kept coming to you all at once? I have many times. 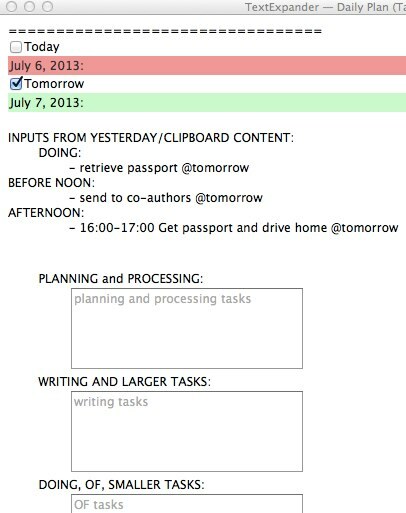 To keep my days under control I use simple daily plans generated by a combination of TaskPaper and TextExpander. 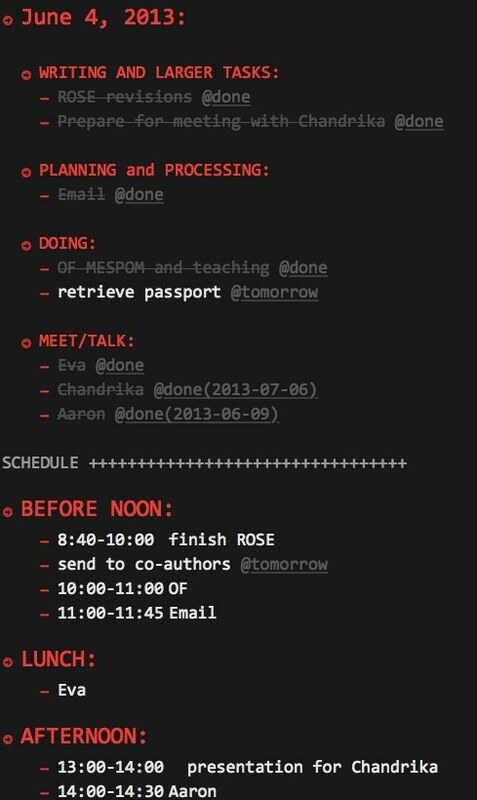 My daily plan is a TaskPaper document which includes several lists of tasks by type of activity (writing, doing small tasks, processing and organizing and meetings) and a time schedule where the same tasks are parsed into particular time slots. To generate such a document I use a TextExpander snippet included at the end of this post. The snippet uses the ability of TextExpander to produce fill-in forms where I type information relevant to my day. everything else that is on my mind (a mini mind-sweep, using David Allen’s terminology). 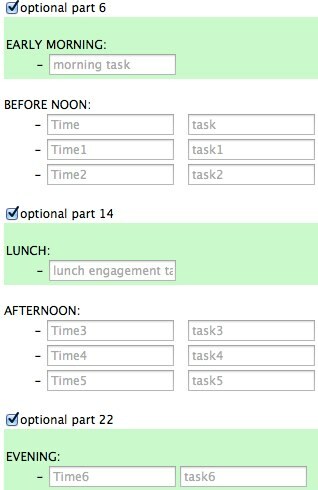 When the daily planning snippet is initiated (my abbreviation for it is “,,day”) in a TaskPaper document, each of the items becomes a TaskPaper task (don’t forget to precede each item with “-“). During the day I cross-out items when they are done. If I can’t do something on that day I mark it with the @tomorrow tag. By clicking on this tag I filter all the postponed items at once and can copy them to the next day’s plan, transfer to OmniFocus, or simply drop. I can also add inputs for tomorrow by pressing a shortcut for adding a TaskPaper item ⇧⌘↩ and typing an item with the @tomorrow tag. You can further develop this TextExpander snippet, simplify it, or make it more complicated. You can also use other software or don’t use computers at all to make your daily plans. The point is to separate doing and deciding what to do. Mixing the two dilutes focus and increases anxiety. This entry was posted in Automation, Tasks and tagged TaskPaper, TextExpander. Bookmark the permalink. Your snippet keeps quitting on me with the following. Any clue how to fix it? The form looks fine, I have a new taskpaper document but it fails? Thanks for trying! I’ve corrected it – try now! Still crashed. Perhaps the problem is in textexpander, it appears it may have something to do with not filling in every time slot in the schedule (or every box)? Sounds like a great system! Is the snippet available for download? I don’t see it in the post.